This exercise was not only interesting it was fun too. Whilst researching the Languages Section, I came across the excellent Mysticgames.com site. I couldn't resist seeing what it 'said' about me. I was surprised at the results. I totally agree with the (Chinese) vices bit, not so sure about the strengths though. The birthstone was spot on and the Tarot representation also was quite acute. You must have a look for yourself, (should be) good fun and quite surprising. It is certainly more accurate than the horoscopes in the 'daily papers'. 07/2008 Every year I go back to the Mysticgames site for my Birthday update and end up spending an hour or two just reading 'stuff'. The Dragon is a Yang, and is the Fifth sign of the Chinese horoscope. You can always tell a Dragon. But you can't tell him much. People born under the flashy and brilliant sign of the immortal and tireless Dragon are most of all noticeable. For a start, they are rarely silent. Secondly, they are almost always highly attractive and magnetic. There is something about Dragon people that says, "I am the majestic one. I rule all men. I am invincible." Dragon people possess natural authority. Even if you cannot stand them, Dragons command your attention. And once they have you under their spell, you cannot take your ears off their fiery discourse. Dragon enthusiasm is contagious. Their big green hearts are set on giving you the same virus they have. Nothing, in fact, daunts this marvellous beast of mythical renown. Dragons know best. And most. About everything that applies to their own destinies. They usually have a mission or a goal so ambitious as to frighten three lions and a gorilla. Fearlessly, without blinking an eyelid, the Dragon will slink through the fire and up the mountainside into any battle and he usually emerges victorious. The Dragon is irresistible. He does not possess mere magnetism. Oh no. The Dragon subject has the power to cloud your mind, put you off guard and tumble you squealing with joy to the floor of his cave. Dragon women are so attractive that even when they are not particularly beautiful, all eyes are on them when they enter a room. It's a question of bearing. This magnificent presence is not only useful to the Dragon in affairs of the heart. Dragons employ their magic in professional ways too. I wouldn't say that Dragons are power-hungry. They don't set out to pursue influence and conquer others to acquire it. Dragons are born with their power. Energy and health fairly beam from all Dragon people. Even apparently reluctant Dragons carry their vigour on their sleeves. They are tireless, going from work to meetings and back to work and then to a party and afterward home to bed down the kids and then out to another gathering and finally home to stay up and listen to some music and chat with their spouse. Ask the next vital, busy, noisy person you meet what their Chinese sign is and they will very likely tell you "I'm a Dragon!" in no uncertain terms. If you have a Dragon in your life and you consider that Dragon to be insensitive to your needs, take my advice-weep! That's right. Snivel. Sob. Bawl. Then through the cloud of your tears, watch the seemingly impenetrable Dragon begin to warm up, glow with pity and finally melt into a greenish heap of altruism at your feet. Tears will melt even the scaliest Dragon heart. They are all sentimental. Finally, what the Dragon needs most from those who live with him and share his life is indulgence. If Dragons make too much brouhaha and wake the baby, they don't do it on purpose. They just have to turn up the radio and rumple the newspaper and make loud pronouncements. They really can't help it if they disturb. They like parties, festivals, holidays, picnics, fireworks and roller coasters. Give them a crepe paper streamer and a paper hat and they'll love you forever. The fiery colour of the ruby symbolizes devotion and desire. It was once believed that the wearer of a ruby was blessed with health, wealth, wisdom and outstanding success in affairs of the heart. Ruby is the birthstone for July and the anniversary gemstone for the fifteenth and fortieth wedding anniversaries. A time for soul searching and meditation; a need for patience and solitude. 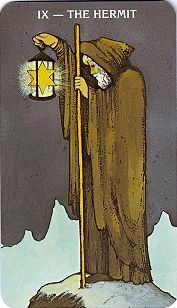 The Hermit is the card of seclusion and turning within. It characterizes an introverted phase in life, during which we shield ourselves from outside influences. We find repose and, above all, are separate from bustling activity and crowds of people. The Hermit therefore stands for an important experience within, through which we can perceive who we are, what we want, and how we can get there. He unites two valuable extremes: the depth of experience and the heights of perception. This card is often wrongly feared by many people. It is only when its qualities are misunderstood that fears of loneliness and abandonment arise. The person who follows the call of the Hermit willingly will find enrichment through clarity, strength, and the joyful experience of being able to be alone with himself. The card Strength has a certain kinship to the card of the Magician (I). Similar to that card, Strength also touches upon the extraordinary power of the secret of a deep, inner harmony. 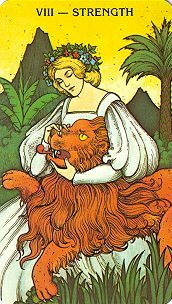 If the great influential strength of the Magician is founded upon the harmony of conscious and unconscious powers, then the vital energy, courage, and passion of this card is an expression of the reconciliation of the civilized person with his or her animal nature. In mythology, this is impressively portrayed by the friendship between Gilgamesch and Enkidu, his previous bitter enemy. 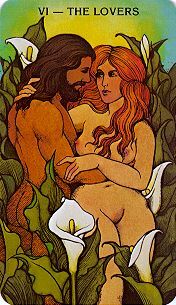 This card makes it clear that we cannot aim to hide our instinctual nature behind pallid virtue but should open ourselves much more to encountering the living, sometimes terrifying archaic powers existing in each of us, in order to gradually tame them through loving acceptance and gentle force. When we do this, not only these primordial powers are available to us, but also all of the reserves of strength that we have used up until now to repress these instincts..
A struggle or conflict, yet strong potential for triumph over adversity. The Chariot stands for the great leap forward. It shows that we can detach ourselves from our familiar surroundings and go our own way. In doing so, the desire for freedom, ambition, the search for paradise lost, or simply our own need for recognition are driving forces. 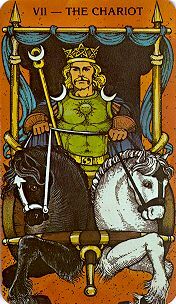 The Chariot is the only Tarot card that shows the departure to be full of confidence and joy. In all other cases, parting is shown to be characterized by feelings of heaviness and fear. Here, however, is a vigorous, undaunted push forward, initiative, and a great willingness to take risks. The card shows a vast amount of skill (steering the chariot), but also inexperience (entering an unknown world). It must therefore be additionally understood as a warning not to overestimate one's own powers and act too self-confidently and euphorically. Instead, we should, in good time, gain the insight that we still have much to learn. A relationship or love affair with a trial or choice involved. This card combines two topics. It indicates a great experience in love, yet also presents us with the perception that this step is connected with a necessary decision: the renunciation of the previous framework of life (the parental home, the bachelor existence, the many flirtations) and the clear avowal of one love. Only this step will lead to the overwhelming experience shown by the Lovers. This card therefore used to be called "The Decision." It can also indicate necessary decisions that have little or nothing to do with love. In such cases, it means that we must decide with our whole heart, without rancour, and without keeping an escape route open. Which of the two themes this card emphasizes can only be determined according to the background of the question asked. In any case, it means the great unconditional "yes." My personality and character cards are identical!